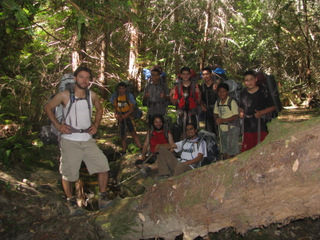 Every summer we hire a small group of men as counselors for our Boys in the Woodz Summer Camp. If you are interested in spending some of your summer outdoors in the Santa Cruz Mountains working with youth, we encourage you to apply. Growing Up Wild is seeking self-motivated men who have experience in outdoor youth leadership to join our team of counselors to lead our summer camp program. Under the direction of the program manager, counselors will work together to supervise diverse groups of boys and lead outdoor experiential activities. Successful candidates will demonstrate the ability to work both collaboratively and independently within a team. They will have positive role model qualities and a respectful attitude toward youth. They will have some knowledge of outdoor science and love working in the outdoors. $450 - $600 weekly stipend depending on experience and certifications. As an overnight camp, all meals are also provided. This position does not include benefits. Please send your cover letter and resume to info@growingupwild.org with “Camp Counselor” in the Subject line.